This edition of Onslow’s fifteenth string quintet has the advantage of being either a two viola or a two cello quintet, as it is published with parts for two cellists or two violists. It is a major work, with good parts for all players, with the 1st violin part having a particularly large numbers of fast semi quavers (sixteenths) in the outer movements. It is known as “The Bullet” due to the circumstances ofits composition: Onslow was boar hunting in the Auvergne when a theme occurred to him. He dismounted and sat on a nearby fallen tree trunk and wrote it down. A boar then burst from the bushes and his companions fired, missing the boar and hitting Onslow. The quintet was completed on his recovery and graphically illustrates his sufferings. George Onslow, an Anglo-French composer, was born in Clermont-Ferrand in July 1784 and died there in October 1853. He was the grandson of the first Lord Onslow and descended, through his mother, from the family of Brantôme. 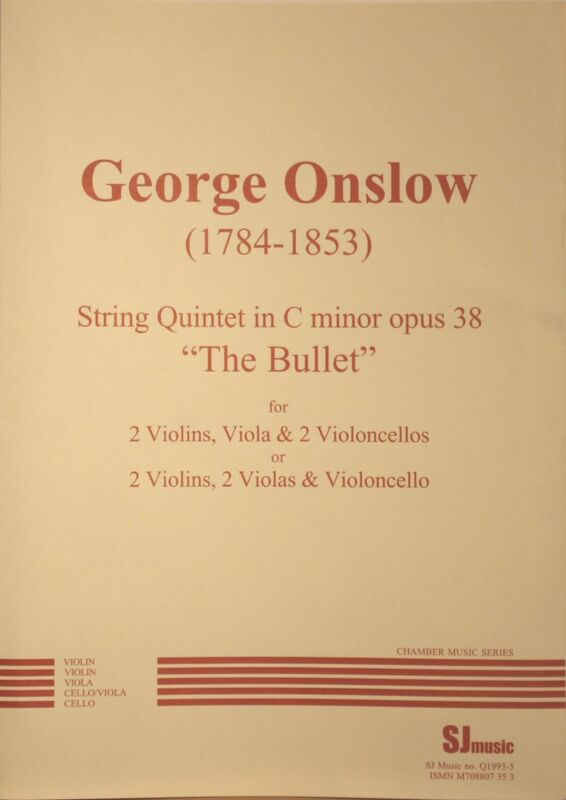 Although he showed no special love of music in his early years, he later became a prolific composer, particularly of chamber music, including 34 string quintets, some for two cellos, some for cello and double bass and some for 2 violas, and 35 string quartets, one of which is also published by SJ Music (Q1999-4). His piano quintet opus 70 is also published by SJ Music (Q2005-2).